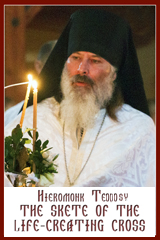 Text from “The Divine Liturgy: An Anthology for Worship”: Pg. 693 (SAE) & Pg. 353 (Tone 7). Verse 1: O God, my God, hear me; why have You forsaken me? The words of my transgressions put salvation far from me (Ps 21:2). Refrain: Through the prayers of the Mother of God, O Saviour, save us. Verse 2: O God, I will call to You by day but You will not listen; and by night, yet it will not be foolish of me (Ps 21:3). Refrain: Through the prayers of the Mother of God O Saviour, save us. Verse 3: But You, the praise of Israel, dwell in the holy place (Ps 21:4). +Glory be to the Father and to the Son and to the Holy Spirit. Now and for ever and ever. Amen. Refrain: Son of God, crucified in the flesh, save us who sing to You: Alleluia. Verse 2: Remember Your congregation which You acquired from the beginning, which You redeemed with the sceptre of Your inheritance (Ps 73:2). Troparion (Tone 7): By Your cross You destroyed death,* You opened Paradise to the thief,* You changed the lamentation of the myrrhbearers to joy,* and charged the apostles to proclaim* that You are risen, O Christ our God,* offering great mercy to the world. 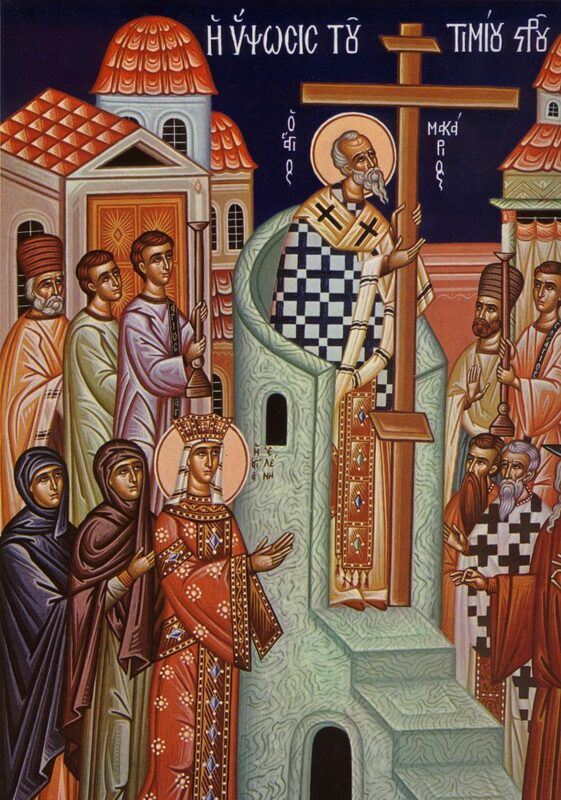 Troparion (Tone 1): Save Your people, O Lord, and bless Your inheritance. * Grant victory to Your faithful people against enemies* and protect Your community by Your cross. Glory be to the Father and to the Son and to the Holy Spirit. Now and for ever and ever. Amen. 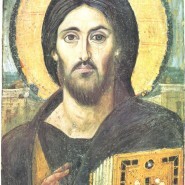 Kontakion (Tone 4): By Your own choice, O Christ our God,* You were lifted on the cross. * Grant Your mercies to Your new community* that bears Your Name. * By Your power gladden the faithful people* and grant them victory against enemies. * May they have the help of Your instrument of peace,* the invincible sign of victory. Prokimenon (Tone 7): Exalt the Lord our God,* and bow in worship at the footstool of His feet for it is holy (Ps 98:5). verse: The Lord reigns, let the peoples tremble (Ps 98:1). Epistle: (Gal 2:16-20): Brethren, we know that a person is justified not by the works of the law but through faith in Jesus Christ. And we have come to believe in Christ Jesus, so that we might be justified by faith in Christ, and not by doing the works of the law, because no one will be justified by the works of the law. But if, in our effort to be justified in Christ, we ourselves have been found to be sinners, is Christ then a servant of sin? Certainly not! But if I build up again the very things that I once tore down, then I demonstrate that I am a transgressor. For through the law I died to the law, so that I might live to God. I have been crucified with Christ; and it is no longer I who live, but it is Christ who lives in me. And the life I now live in the flesh I live by faith in the Son of God, who loved me and gave himself for me. Alleluia (Tone 1): Alleluia, Alleluia, Alleluia! verse: Remember Your congregation which You acquired from the beginning (Ps 73:2). verse: But God is our king before the ages; He was wrought salvation in the midst of the earth (Ps 73:12). Instead of “It is truly…”: O my soul, magnify the most precious Cross of the Lord. Irmos (Tone 8): You are a mystical Paradise, O Mother of God, who though untilled, have brought forth Christ. He has planted upon earth the life-giving Tree of the Cross. Therefore today as we raise it on high we bow low and we magnify you. Communion Verse: Praise the Lord from the heavens; praise Him in the highest (Ps 148:1). Upon completion of the Liturgy we venerate the Holy Cross: To Your Cross, O Master, we bow in veneration, and we glorify Your holy Resurrection (3x).